Applications now closed. Top startups announced! Bridge to MassChallenge Biscay is an international startup competition that identifies and accelerates the top startups in Biscay and Gipuzkoa, and connects those startups to the global market and MassChallenge's global network. We are pleased to announce the third year of Bridge to MassChallenge Biscay, in partnership with the Biscay Regional Government of the Basque Country. 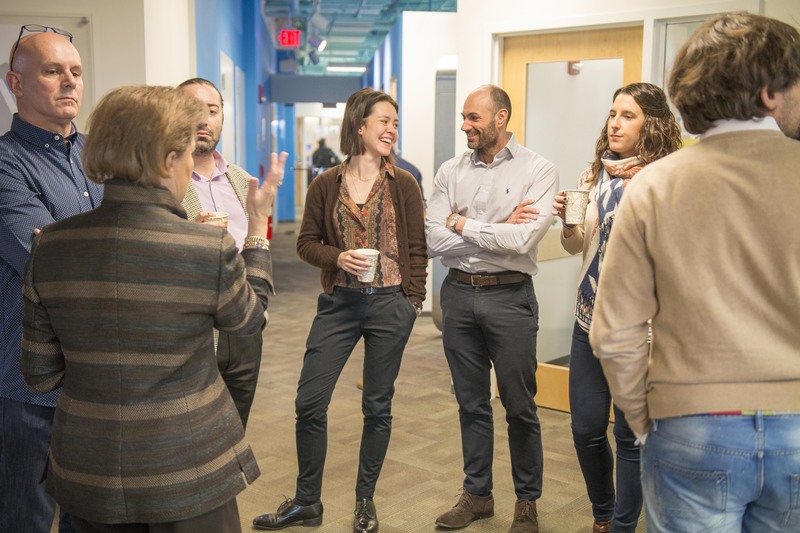 Bridge to MassChallenge strengthens innovation ecosystems and drives the creation of high quality jobs by supporting entrepreneurs and connecting them to our global network. We will be supporting entrepreneurs in both Biscay and Gipuzkoa. Applications for the Biscay startup competition open on Friday, February 12, 2019 at 0:00 CET and the deadline for submissions has now been extended to Sunday, February 24, 2019 at 23:59 CET. Local and international expert judges will evaluate online applications to determine which 25 startups will advance to an in-person pitching round in Bilbao on March 11-13. A final pitch round during the boot camp will determine the Top 4 teams to advance to the semifinal round of the global MassChallenge competition, with a stipend provided by the Regional Government of Biscay for that opportunity. “B2MC Biscay was in itself a great experience: an intense week perfectly organized for us to attend great talks from mentors, entrepreneurs and experts in different fields from sales, to IT or VC industry experts. That week was also fun, allowing a group of local entrepreneurs to connect and bond. But the best part of B2MC Biscay was that it helped us win a spot in the 4 months long MC Boson program, which is the actual acceleration program, which we did along dozens of other startups from the US and other countries. This program helped our company make meaningful partnerships and receive mentoring from advisors who would have otherwise been unthinkable for us. I strongly recommend both programs to any entrepreneur willing to take his/her startup to the next level. S-There develops medical technology for the monitoring of biomedical parameters. Its first product is based on a medical device made up of different sensors that is easily placed in any toilet to perform urinalysis routinely in the comfort of the home. The device is capable of detecting through the urine glucose, hydration levels, proteins and blood, parameters used in clinical practice for the early diagnosis and monitoring of diseases such as diabetes and kidney disease among others. Lukkap Data & Analytics – Why would companies want to use our software, Xpocket? Because 80% of them believe they provide outstanding customer service, but only 8% of customers say they are getting it. Main reason? Lack of real stakeholders knowledge. Xpocket solves it. Based on statistic models, we measure what drives your results and why. The methodology behind It measures each moment, fact and perception lived, and correlates the data to business KPIs. At heart, we measure so you can improve your business results. Medicsen is developing world first non-invasive artificial pancreas, a closed loop system for the smart management of diabetes and other chronic diseases by interconnecting an innovative and IP protected non-invasive automatic drug delivery device (Smartpatch), with a software based on personalized predictive and preventive learning algorithms (Ai) and an easy to use Chatbot App creating a lifestyle coach based on future glucose prediction and individual behavior intervention. Smowltech – We aim to help organizations enhance their online academic integrity in order to gain trust and prestige in the market, providing a continuous online proctoring service using facial recognition, enabling organizations increase their online offer with credibility and cost-effective. A unique approach (named as cool vendor by Gartner), which adapts to each institutions pedagogical methodology. Scalable, no limits of volume, seemless integration to any platform and flexible. Stoor – We are a platform that acts as an integrator and help producers and customers to complete successfully the transaction the project. Producers (architects, engineer and designers) who perform BIM projects, can open their own online studio, without investment, to create a digital portfolio and sell to worldwide customers. Customers (another architect, developer or Gov) get a very diverse portfolio of different buildings where they can buy quality BIM projects that fit their needs. Appsamblea is a guaranteed digital voting platform (SaaS) that allows any type and size of organizations to manage and carry out any voting process in a very easy and cost effective way. It verifies the voter (KYC, digital id), it guarantees the secrecy of the votes with advanced encryption and provides unalterable results using blockchain in its maximum security layer. It also provides a powerful tool to segment and manage the census and an intuitive editor to customize any voting process. AcceXible is a startup developing a speech analysis platform based on AI models to early detect diseases as dementia, parkinson and coronary disease, among others. Our aim is not only to develop a platform, we also aim to transform this project into innovative solutions that different stakeholders find worth using. In order to do so, understanding market needs, end users, regulation and certification is mandatory. Apparazzi – News happen any place, any time. But journalists are not everywhere. You and your smartphone are the only ones that can tell what’s happened. Now, you have the opportunity to earn money with content created by you. You are an Apparazzi. We are a huge content router, from its diverse origins to the media that buy them. Its main objective is to make sure that the media receives verified material of real informative interest. Hermeneus is a Software (SaaS) build in house for retail aggregators (such as trade associations, cooperatives, banks, telecommunication companies, municipalities, county councils, etc...) that allows them to digitalize their business ecosystem developing as many complete web sites as they want with all the tools needed for products & services ecommerce (payment systems, logistic, shopping cart, etc...) and solutions tailored to each sector. Playoneer – The lack of scale of the players' recruitment process is the main obstacle for development in the amateur industry. Currently scouts need to physically attend matches, spending time and resources for limited return. Playoneer, like a LinkedIn of soccer, makes it easy for clubs to search talent based on statistics, physical, tactical, technical or leadership abilities. Playoneer builds and offers an international talent pool of players, while building unique international experiences. Testualia is an e-learning assessment tool able to create unlimited tests, all different but homogeneous in difficulty, taxonomy and content. It is based on a structured question pool where each question is classified according to several criteria that will be used to create each test. TESTUALIA optimize the learning assessment process being the perfect tool to effectively prepare multiple choice exams and/or improve the e-learning experience. It is not a random test, it is TESTUALIA. Indicate Solutions is developing a diagnostic PoC kit influenced by next generation mass-market IVDs. The solution is a rapid genetic test to detect EGFR L858R and T790M mutations generating a same-day visible yes/no answer. The product will be a same-day result Companion Diagnostic (CDx) for TKIs, which will allow physicians to prescribe these drugs immediately, avoiding significant delays in the prescription of up to one month. Naru Intelligence develops Artificial Intelligence systems for oncology. We are focused on improving outcomes of every patient and optimizing hospital performance and clinical research. We specialize in the development of machine learning algorithms that integrate Real World Data in order to support and enhance clinical decisions. Our main objective is to improve personalized care through the analysis of each patient’s experience. The platform will be able to aggregate demand from charging spots and ultimately use smart grids to select energy sources and balance demand. Tagenea – Currently, the offline sales channels of the retailers are suffering an aggressive global competition with a lack of tools to be able to compete with the dynamic e-commerce strategies. The market opportunity is to to reduce the cost of the current manual tagging work, to provide tools for the offline retailers to quickly synchronise with the market trends and the e-commerce, and also drive a complete omni-channel experience of the final customers. Applications for Bridge to MassChallenge Biscay are now closed and the top 15 startups have been announced! MassChallenge is the most startup-friendly accelerator on the planet. To date, 1,500 MassChallenge alumni have raised over $3 billion in funding, generated approximately $2 billion in revenue, and created over 80,000 total jobs.